Mammals possess several lines of defense against microbes. One of them is activated when receptors called Fprs, which are present on immune cells, bind to specific molecules that are linked to pathogens. Researchers at the University of Geneva (UNIGE), Switzerland, showed in 2009 that these same receptors were also present in the nose of mice, probably to detect contaminated food or to avoid sick conspecifics. The biologists now describe in the journal PNAS how Fprs have acquired this olfactory role during rodent evolution, moving from the immune system to a neuronal system. This innovation results from two genomic ‘accidents’ that occurred several millions years apart during the evolution of rodents. “We wanted to understand how Fprs evolved to be expressed at the surface of olfactory neurons and acquire a new function”, explains Quentin Dietschi, from the laboratory of professor Ivan Rodriguez at the Department of Genetics and Evolution of the Faculty of Science of UNIGE and co-first author of the study, expanding the research of 2009, already led by professor Rodriguez. The biologists, in collaboration with Alan Carleton, professor at the Department of Fundamental Neurosciences of the UNIGE Medical School, have demonstrated that this genetic innovation is due to two genomic accidents that occurred during rodent evolution. It is by comparing the DNA sequences of various rodent species that the researchers were able to go back in time and follow the evolution of the targeted genes. We rarely transmit a perfect copy of our genome to our offspring. These differences from one generation to the next are sometimes at the origin of important innovations. “During evolution, a gene encoding one of the Fprs landed near a DNA sequence regulating the expression of an olfactory receptor. This regulatory element was thus hijacked, allowing the expression of the Fpr at the expense of that of the original olfactory receptor”, says Joel Tuberosa, co-first author of the article. Thus, the ancestor of today’s hamsters, rats and mice acquired a new olfactory capacity, probably that of scenting traces of microbes present in its environment. Mammals express Fprs in their immune cells (yellow). 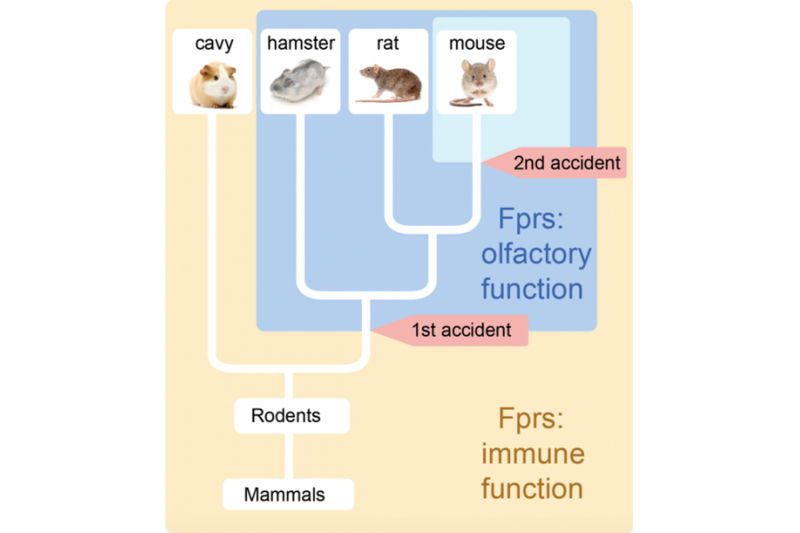 A first genomic accident led to the expression of an Fpr in olfactory neurons of a rodents’ ancestor (dark blue). This was followed by a second accident that occurred in the mouse lineage (light blue).